HARTFORD, Conn.--(BUSINESS WIRE)--The Travelers Companies, Inc. (NYSE: TRV), the country’s largest workers compensation carrier, today released its Injury Impact Report, which identifies the most common causes of workplace accidents and injuries. 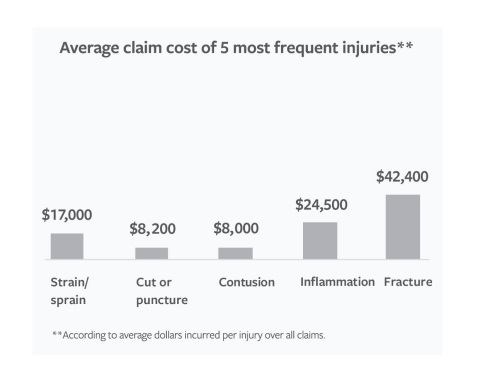 The company analyzed more than 1.5 million workers compensation claims filed between 2010 and 2014 from a variety of business sizes and industries. Traumas occurring over time, for example when a part of the body is injured by overuse or strain (4 percent). The above incidents most often resulted in strains, sprains, cuts, punctures, contusions, inflammation, fractures or chronic sicknesses resulting from a type of work (e.g., a skin disease caused by chemical exposure). On average, strains and sprains resulted in 57 missed work days, followed by cuts and punctures at 24 days. Of the most commonly-resulting injuries, inflammation and fractures caused the most time away from work at 91 and 78 days, respectively. 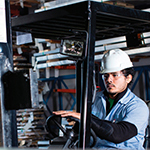 While material handling accidents were the top cause of injuries overall, these were especially common in the manufacturing and retail industries, causing nearly 40 percent of injuries in both sectors. Falling from height was among the top causes of injuries in both the construction and retail industries. The oil and gas industry was the only segment in which motor vehicle accidents were one of the most frequent causes of injury. Eye injuries were one of the most frequent types of injuries in manufacturing and construction. Additional industry-specific information can be found in the full Travelers Injury Impact Report. 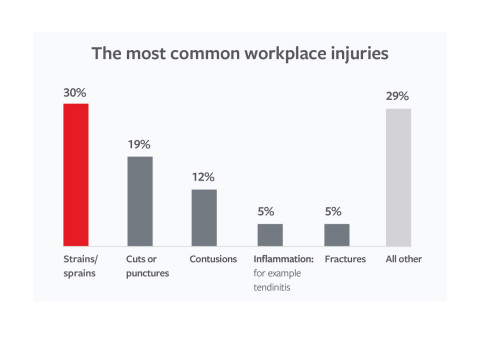 The injuries with the highest average incurred costs included amputations, dislocations, electric shock, crushing and multiple trauma injuries, such as breaking multiple bones at once. These severe injuries have typically occurred less frequently overall. Travelers has developed an approach called Travelers Workforce AdvantageSM to help businesses establish a safer workplace and to help prevent employee injuries. The approach begins with the development of safety programs that focus on the employee and highlights three key areas: attracting and hiring the right candidates; onboarding and training; and supporting and engaging the current workforce. Despite best efforts to develop a robust safety culture, accidents can still happen. Travelers ConciergeCLAIM Nurse ® – a patented workers compensation claim program that simplifies the claim process for injured employees and helps them recover and return to work as soon as medically appropriate – reduces days out of work by an average of 41 percent and the amount of time it takes to close a claim by 31 percent. The program, which was recently expanded and is now available in more than 60 locations across the United States, is part of Travelers’ patented TravComp workers compensation claim process which consistently outperforms industry benchmarks for successful return to work and claim outcomes. To learn more about Travelers’ workers compensation products and services, visit www.travelers.com. The Travelers Companies, Inc. (NYSE: TRV) is a leading provider of property casualty insurance for auto, home and business. A component of the Dow Jones Industrial Average, Travelers has approximately 30,000 employees and generated revenues of approximately $27 billion in 2015. For more information, visit www.travelers.com.